Let me start off by pointing out that we did indeed break below the yearly cycle low yesterday. I’ve been saying for a couple of weeks now that a break of 1044 would change the pattern of higher lows. 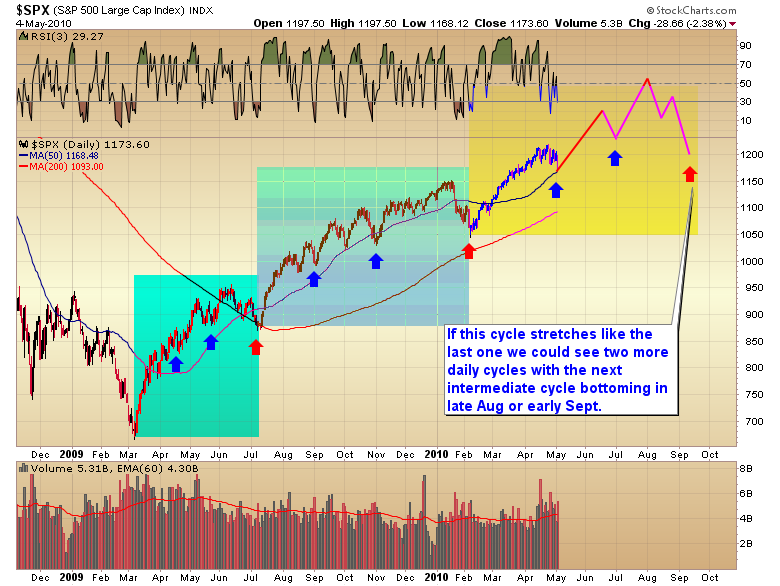 That would be the first warning shot across the bow that the cyclical bull might be in the process of expiring. Does that mean I want to short stocks? Are you crazy? No way I want to fight with a bear market and the Fed’s printing press. For one Ben has already aborted a left translated 4 year cycle. Never in a million years would I have believed that was possible, but happen it did. Print enough money and the Fed could just as easily negate a broken yearly cycle low. And if you think he won’t do it I have some ocean front property here in Las Vegas I’d like to sell ya? Sell short? No way no how. Not even with your money. Let’s face it the mathematics on the short side are just not conducive to getting rich. It took a year and a half for the market to drop 58% in the second worst bear market in history. Sure one can leverage up but if you happen to get hit with a vicious bear market rally or the rules are changed (ban on short selling) you run the risk of losing everything. Need I remind everyone that leverage is what is bringing down the global financial system. Leverage is like walking through a dynamite factory with an open flame. Sure you might survive but you’re still an idiot. 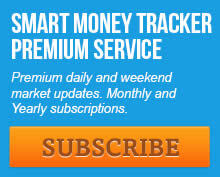 Trading bear markets is tough to do even if the bear is allowed to run its course undisturbed. But I guarantee the powers that be will throw everything they can at the bear. I just don’t need those kind of odds stacked against me, especially when there is easy money to be had. Now that I’ve made my position clear (just so there won’t be any misunderstanding later. There will be none of this “hey you said the bear is back and we should short stocks. How come the market went up and I lost all my money”). I’m emphatically telling you that by selling short you are taking your life into your own hands. If you are bound and determined to fight the Fed, Wall Street, Washington and an angry and tricky bear, you are going to do it all on your own. Leave me out of it. I’m going to be over in the corner picking up gold coins, you can join me if you want to. Whenever the market doesn’t do what it’s supposed to do it’s probably a good idea to pay attention. Yesterday markets all over the world were down and down hard. Some by over 3%. The futures were signaling a big gap down. By all rights the S&P should have followed the rest of the globe lower today. It didn’t. We ended the day positive. Lately we are hearing the D word (deflation) thrown around quite a bit. Let’s face it we are going to hear this every time assets start to drop. However let me remind everyone that Ben halted the worst deflationary spiral in 80 years in just a little over 7 months. Ben has clearly proven that a determined government, in a purely fiat monetary system, can reverse deflation. The question isn’t whether or not we are going to experience deflation. The question is simply how long will the powers that be allow it to last before they crank up the presses and flood the world with paper again. The cold hard reality is that the USA has now gone down the path of no return. We are piling on trillions upon trillions of debt in a futile attempt to spend & stimulate our way out of bankruptcy. I don’t know about you but generally speaking isn’t it counterproductive to go deeper in debt if one is already broke? This debt can’t possibly be serviced … ever. So we have two choices. One we can eventually just default on our massive mountain of debt. At some point we just throw up our hands and cry uncle. Folks if the United States of America chooses to default on its debt then yes we are going to see a deflationary storm cover the world in ruin and despair. The second choice is to inflate away the debt by printing trillions and trillions of federal reserve notes out of thin air. This course will buy us some time. It may even briefly appear that we’ve cured our problems (it has seemed that way until recently hasn’t it?). If we choose this path, then unless someone like Volker comes along and forces us to take our medicine, the inflationary spiral will continue until a final hyperinflationary storm destroys the country. Now each of you has to ask themselves which you think is more likely. Will the US all of a sudden come to its senses, default on its obligations to halt the exponential growth of debt, thus unleashing a deflationary holocaust upon the world…or will we just continue to kick the can down the road like we’ve been doing for the past 10 years, thus making the debt burden bigger and bigger and rendering it serviceable only by hyperinflating the money supply? How you answer that question will dictate how you want to invest for the next 5-10 years. If you think like I do that we will continue to kick the can down the road then the easy investment is to just get on board the secular gold bull and hold on. This entry was posted in Uncategorized on May 26, 2010 by Gary. The stock market is really nothing more than a gauge of human emotions. And just like bodies in motion, human emotions also follow the laws of action and reaction. In simple terms the bigger the bull the bigger the bear and vise versa. We’ve had a ring side seat to this as we are witnessing one of the most aggressive bull markets in history unfold after the second worst bear market ever. Lately we are seeing this play out on a smaller scale in the intermediate swings. After the powerful initial thrust out of the `09 bottom and the final spurt into the second leg top we witnessed a rapid correction of 9%. 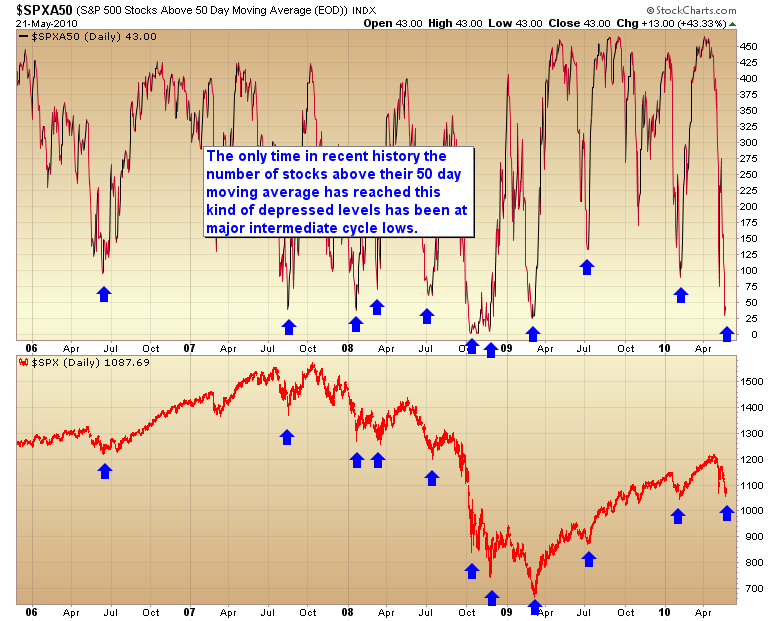 During that correction sentiment again quickly reached excessively bearish levels. The general consensus was a second deflationary spiral was upon us. It was of course just a brief profit taking event like I said it would be. But that’s beside the point. 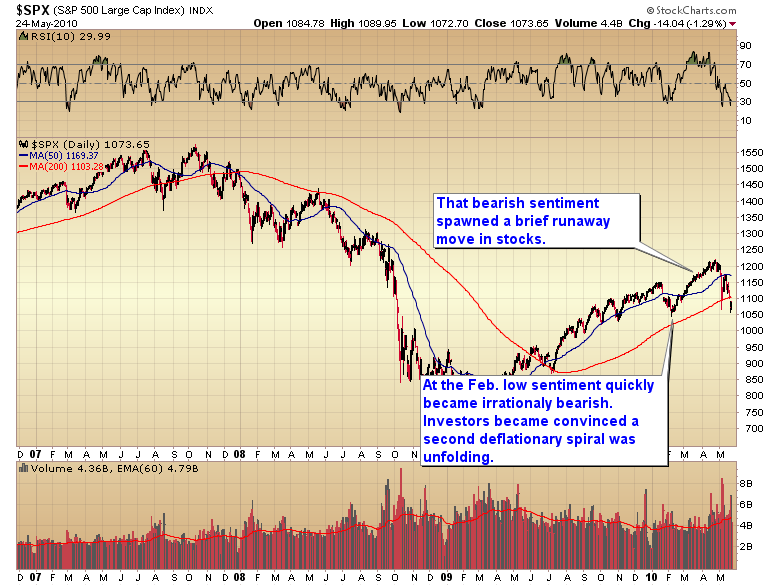 More importantly the severe bearish sentiment generated a powerful runaway move out of the February bottom. That extreme move in turn swung sentiment to levels of optimism in line with what we saw at the `07 top. Now the law of action and reaction has again taken the market to the opposite extreme. Those extreme bullish sentiment levels generated during the runaway move have now produced one hell of a hang-over complete with a mini-crash. So here we are again. Human emotions have now run to bearish extremes similar to, and in some cases even worse than what we saw at the `09 bottom. If this is only a correction in an ongoing cyclical bull market then we have now built a massive negative sentiment base from which to launch the next explosive move higher in the ongoing war of action and reaction. This entry was posted in Uncategorized on May 25, 2010 by Gary. Sentiment and breadth have reached such extreme levels that even if the market has resumed the secular bear trend we are probably due for a strong counter trend move. You can see from the following chart the number of stocks trading above the 50 day moving average has reached such depressed levels that even in the last bear market these kind of skewed levels have led to sharp rallies. Now I’m not saying we are in a bear market yet. For me to go that far I would need to see the pattern of higher highs and higher lows broken. That just hasn’t happened yet. 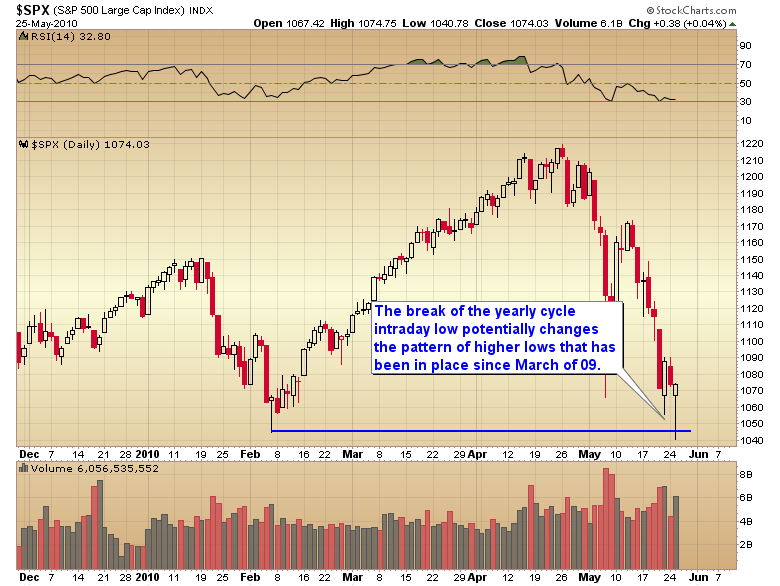 We also didn’t get a Dow Theory non-conformation at the recent April top. That tends to happen at the majority of major bull market tops. And we certainly don’t have a Dow Theory sell signal yet. That can’t happen until the market puts in a secondary low and then that low is broken by BOTH the industrials and transports. The market is in the process of putting in the secondary low right now. We would need to see the rally out of the impending bottom fail and both averages break to new lows before a sell signal could be issued. However as I’ve pointed out a move below the February yearly cycle low would be a big negative and would push the odds in favor of the market breaking below the now due secondary low. But as of this moment there’s no sense in doubling down on the short side into these kind of oversold levels. Even if the market is rolling over again we should see a bounce. A safer strategy would be to sell into the rally. However as long as there is a bull market still intact I consider it a waste of time and capital trying to fight with a bear market. Let’s face it the second greatest bear market in history only racked up a 58% decline and the odds aren’t good that anyone managed to rack up anything even close to that during the volatile bear. If someone managed to catch even 75% of the move they were doing great. However in less than half the time it took the bear to run its course mining stocks quadrupled or more those kind of gains. The mathematics of the short side prevent one from making the big money. The reality is that the most one can make on the short side is 100% and even that isn’t possible if you are shorting the indexes. The potential in a secular bull market is typically many multiples of that. Most big bulls tend to move 2000% or more from beginning to end. Realistically one isn’t going to get rich on the short side. They may get an ulcer trying to wrestle with the bear and the Fed but they won’t get rich. Those who can ignore the daily wiggles and ride the bull will get rich and a big plus is Ben will do everything he can to help you has he tries to fight the bear. This entry was posted in Uncategorized on May 24, 2010 by Gary. I know this is hard to do, especially when one is weathering draw downs. And of course a liberal dose of gloating from the bears during these times doesn’t help either. But let’s not get sidetracked by the little things and let’s face it the haters are going to show up every time gold corrects. We really should be used to that by now. They’ve been doing it for 10 years. The cold hard reality is that gold is still in a secular bull market and the naysayers are having to ply their trade from ever higher levels. So let’s take a look at what’s really happening shall we. The single most important point everyone should keep in mind is the breakout above the 1980 high of $850. If it wasn’t for a once in a generation stock and credit market collapse I don’t think gold would have ever dropped back below that level. Even so the move was very brief and has now been tested at the last B-wave bottom. Folks I seriously doubt the world will ever see sub $850 gold again. 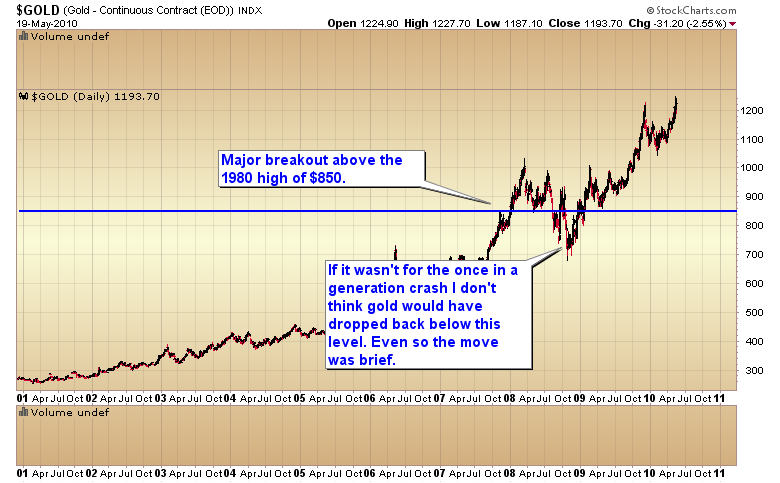 Just like we’ve never seen sub $250 gold after the breakout in the 70’s. So anyone forecasting $700 gold just doesn’t understand how bull markets work. It just ain’t gonna happen. 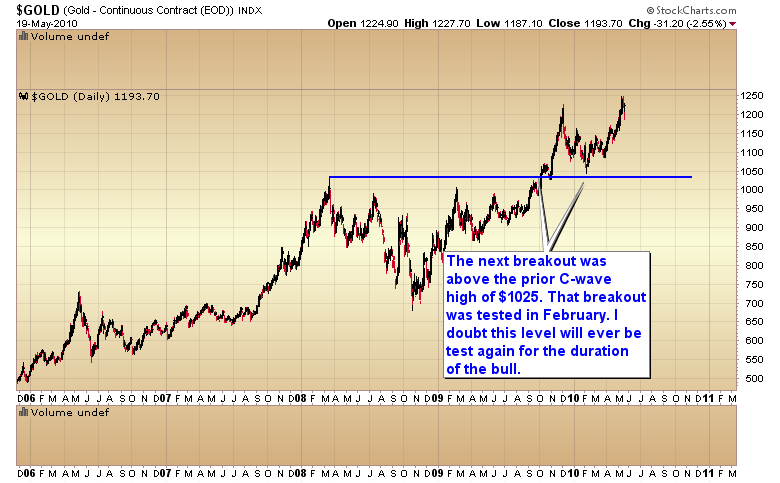 Next came the breakout above the last C-wave high at $1025. That breakout was also tested during the February yearly cycle low. I doubt we will see gold back below $1000 for the remainder of this bull market. 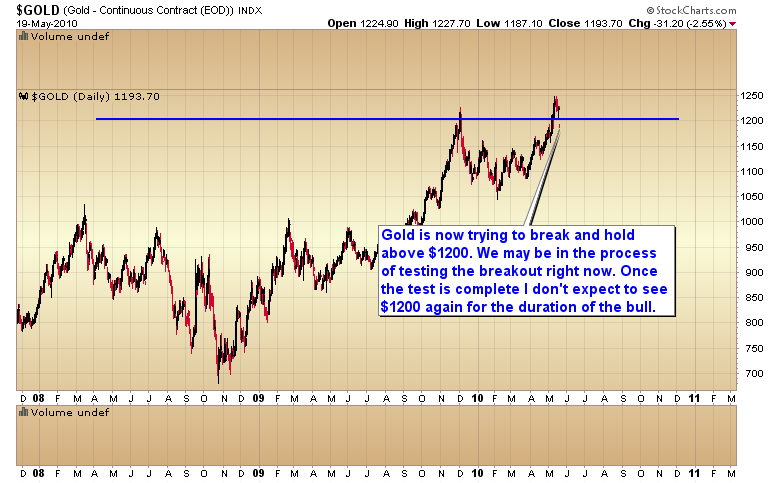 Now gold is trying to breakout and hold above the next big resistance level of $1200. The initial break in December was repulsed. 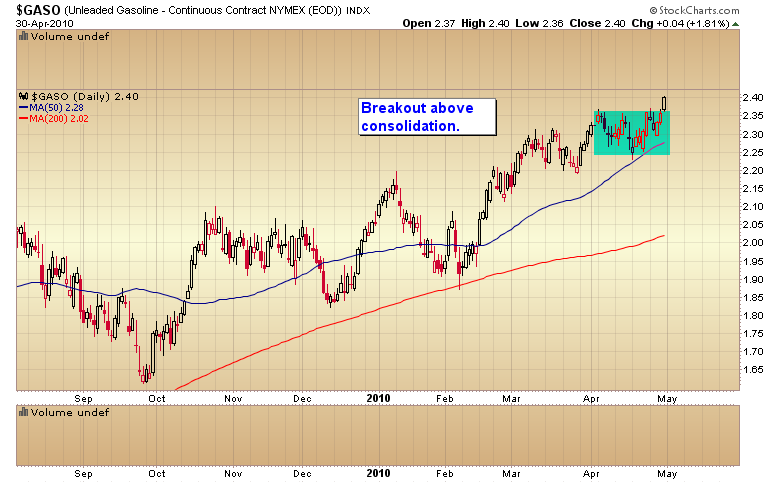 Now we have a second break that is in the process of testing the breakout. 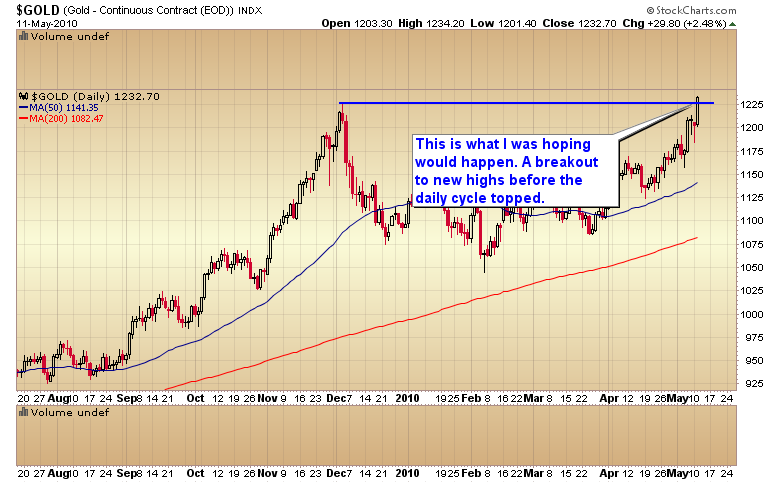 Now I have no idea whether this breakout will be the one that holds or whether gold will have to consolidate a bit more. 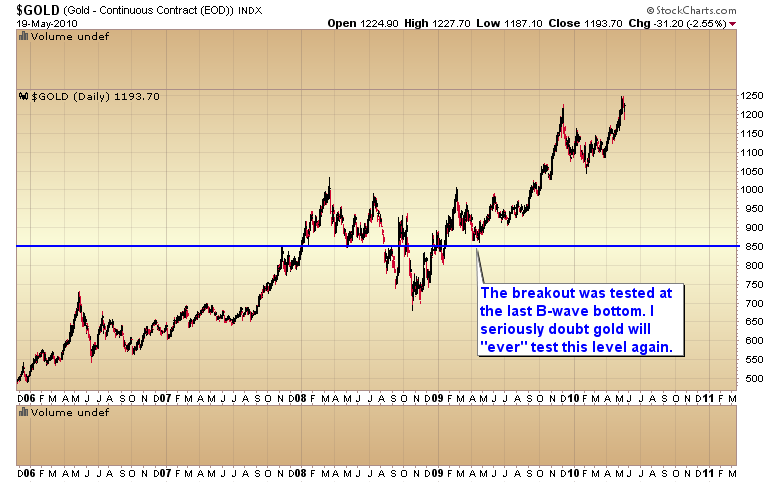 But sooner or later gold is going to break above this level and never look back. I think we probably have enough time left in the current intermediate cycle for it to happen soon, but if not, I’m confident it will happen and I’m on board and ready for the ride when it does. My suggestion is when you start to get sidetracked by the daily wiggles or the intermittent draw downs you come back and look at these charts and stay focused on what really matters. This entry was posted in Uncategorized on May 20, 2010 by Gary. 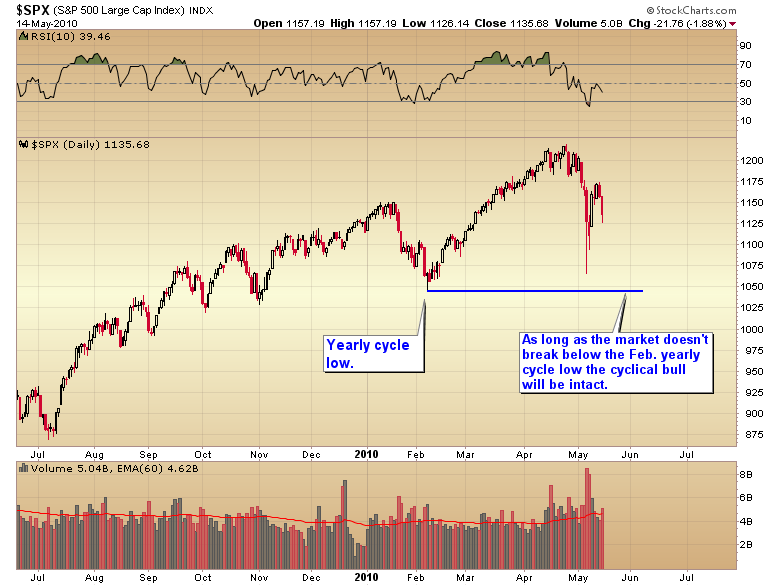 Until the pattern of higher highs and higher lows is broken this will remain a cyclical bull market. Shorts trying to jump the gun run the risk of getting caught opposite the Fed’s printing press. The secular bear trend can’t resume until a yearly cycle bottom is broken. That yearly low came this year on February 5th. 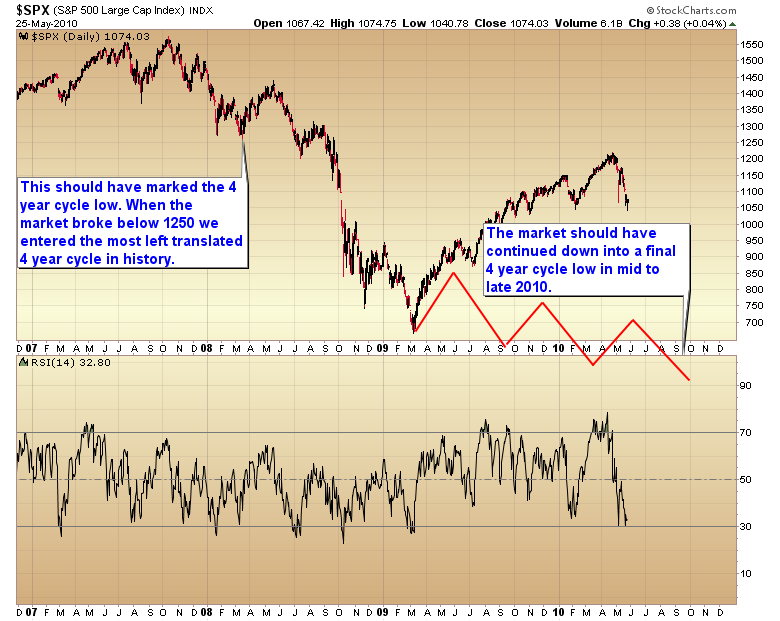 As long as the decline holds above that level this will continue to be an ongoing cyclical bull market. 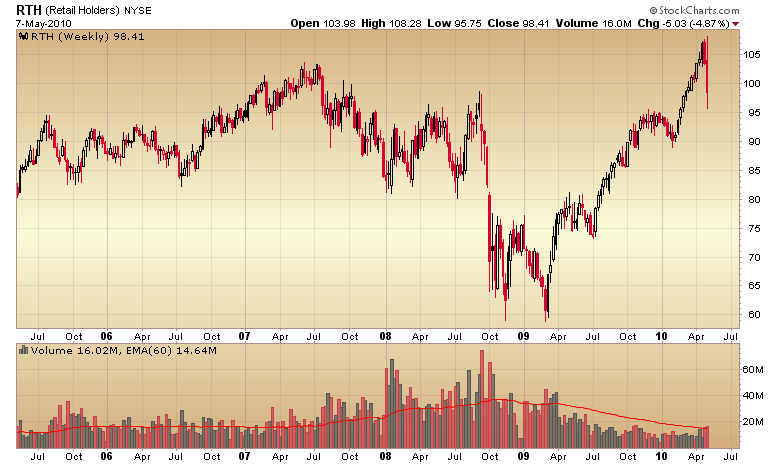 If the decline were to break 1044 then we would have our first warning that the secular bear trend has returned. The correct strategy would not be to sell the break though. Sentiment has skewed extremely bearish already. That kind of sentiment almost always spawns a multi-month rally in bull markets and a powerful counter trend rally in bear. 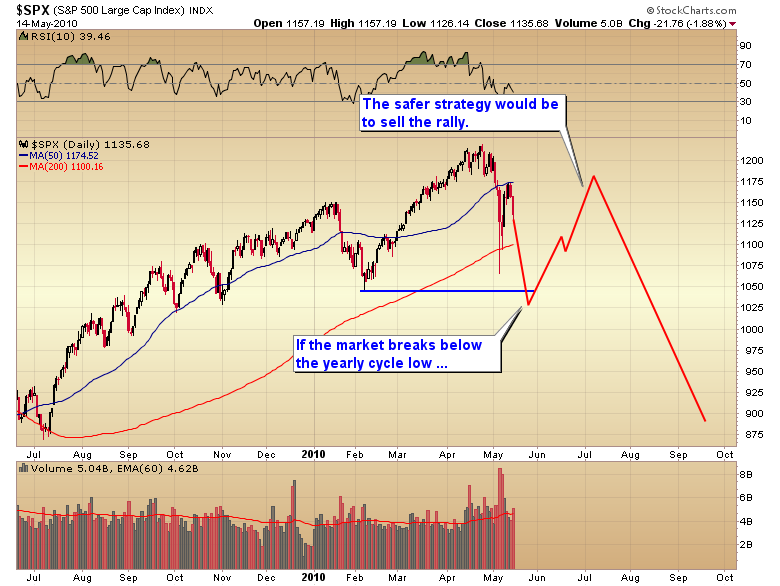 A safer strategy would be to sell the rally not the breakdown. This entry was posted in Uncategorized on May 17, 2010 by Gary. Gold finally broke out to new highs. 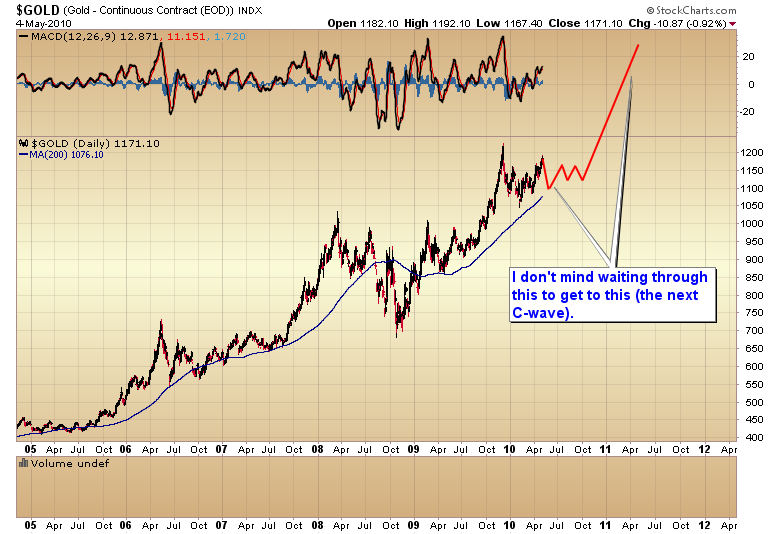 That puts the odds squarely in favor of a C-wave continuation. I went over a bit of strategy in tonight’s report for those not already in. I’m going to go over stats and cyclical structure for the remainder of the C-wave in tomorrow’s report. For those of you thinking about getting side tracked by a meaningless daily cycle low that is coming due, let me tell you from bitter experience the one thing you don’t want to do is lose your position at the beginning of a C-wave or C-wave continuation. At this point the daily cycle corrections aren’t profit taking opportunities. That will come as we near the end of the C-wave. At this time a daily cycle low is a last chance opportunity to get as invested as you are comfortable with, whether that be 50%, 75% or 100% will be up to each individual. Don’t forget in bull markets and especially during aggressive C-wave advances the surprises come on the upside. Daily cycles can and often do run exceptionally long as a C-wave starts to gain momentum so losing ones position in an attempt to “time” a short term correction can potentially cost one many percentage points. It’s just not worth the risk. This is the time to heed “Old Turkey’s” advise. Folks I have no doubt this will be the greatest bull market that any of us will ever see in our lifetime. Since November of `08 the precious metal sector has been doing everything but hit investors over the head with a pipe to let us know this is the leading sector of this bull. 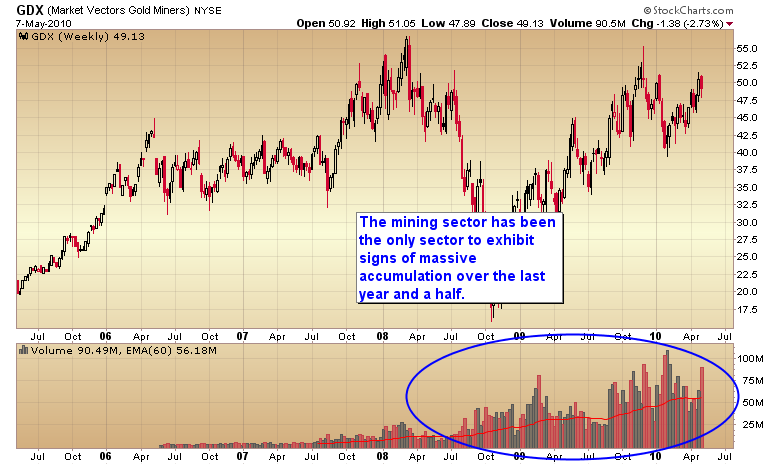 Miners are the only sector exhibiting massive accumulation. 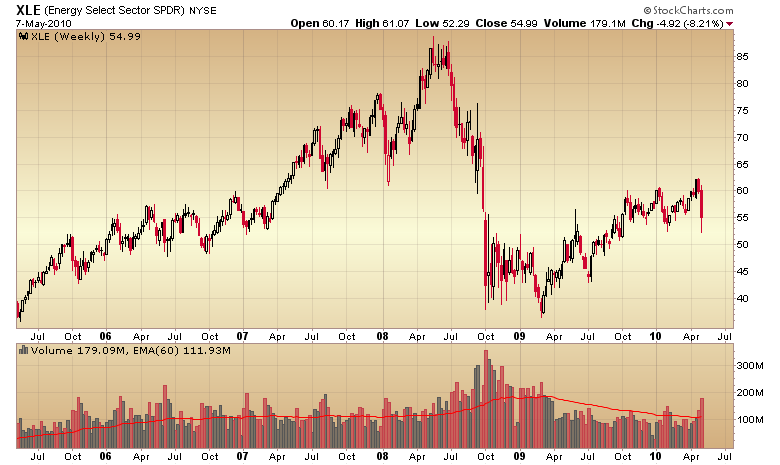 Compare the above chart to other sectors during this bull and you will see where the smart money has been positioning. These are just a few sectors, but the picture is the same no matter where you look. Steadily declining volume. Only miners are showing heavy accumulation. Once the HUI & silver join gold, platinum and palladium at new highs the entire precious metal sector will move into a vacuum with no overhead resistance. That is going to be incredibly bullish for the sector. This entry was posted in Uncategorized on May 12, 2010 by Gary. History says we should test the lows at some point in the next few weeks. The fact that we ended well off the lows does muddy the picture at bit, as most “crash” days have ended at or close to the lows of the day. So perhaps this time will be different. I’m going to point to an interesting parallel that I’ve been watching. 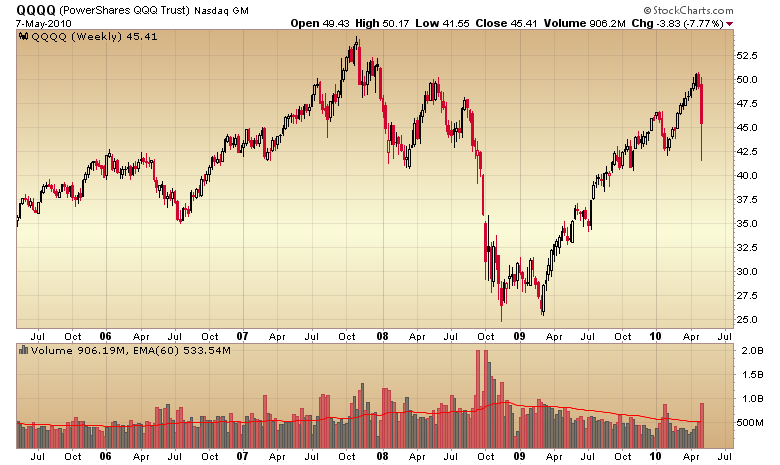 I’ve noted that the first and second leg of this bull roughly followed the same pattern as the 03-07 market. The correction following the second leg copied the 04 correction if not in duration in magnitude. I’ve speculated that this bull would bypass the middle phase of a “normal” bull and move straight into the final phase. 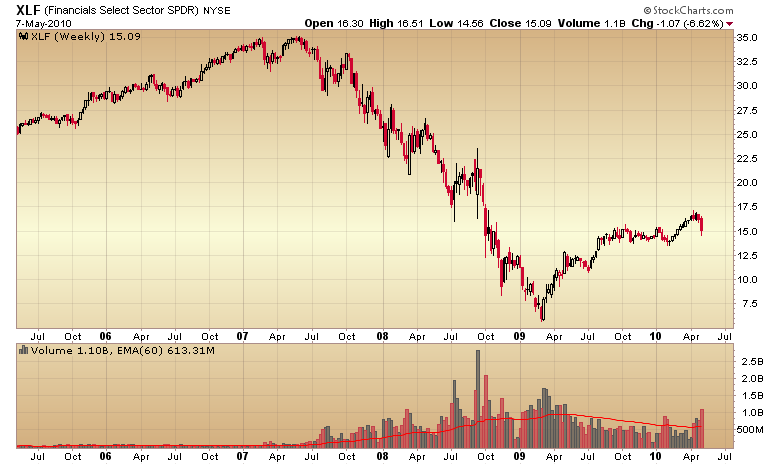 In 06 the final phase began with a 7 month runaway move. We certainly saw a runaway move out of the February 5th bottom. I must admit I thought it would last a bit longer than 2 1/2 months but I guess we shouldn’t be surprised as everything has been unfolding much faster during this bull. 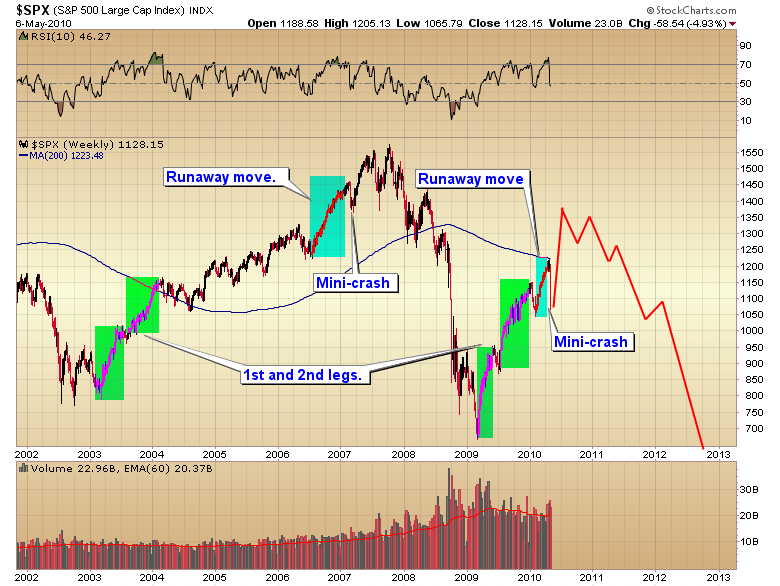 In 07 the runaway move ended with the mini-crash in February. Yesterday certainly qualifies as a mini-crash. So we are still following the 03-07 template. If the pattern holds then we should expect a recovery soon and a final surge higher into an ending blow off top. From there we should roll over into the next leg down in the secular bear market. Not that I want to buy into a secular bear market, but sometime in the next couple of weeks we should get a intermediate buying opportunity…unless this time is different and we just continue higher from here. This entry was posted in Uncategorized on May 7, 2010 by Gary. I’ll start off by saying that I don’t think the recent selloff is going to be an intermediate type decline like we saw in January and February. It’s probably too early. Most intermediate cycles have three daily cycles nested within them. This is only the first daily cycle correction. We should still have at least one more daily cycle yet to go and it’s probably more likely we have two with the next intermediate term decline coming around the end of summer. Let’s face it the market has only dropped 3.8% so far. Even if it reaches the 1150 support level we would still only be looking at a meager 5.7% decline. I have to ask is it really worth all the false starts and multiple losses trying to catch a minor short trade in a cyclical bull market? Let’s face it virtually no one is going to sell at the exact top and exit at the exact bottom so the odds aren’t good one would catch even 5%. And if the bull does something to surprise us a profitable short position can evaporate overnight. Hey all it would take would be the Fed extending the TARP program or another round of QE and any correction would be aborted immediately. No, it’s just not worth the big risk of big losses for small returns. Shorting a bull market just isn’t a very profitable way to make money. That being said I like the way gold and miners are holding up so far. Neither one has even dropped below the 10 DMA yet. All four of my conditions have been met. That means I’m back in “ Old Turkey” mode. The goal is to reach strong hand status again. You don’t achieve that by trying to time every little wiggle. Now I’m certainly aware that this could be an A-wave topping out and I might have to ride a B-wave down. I’m perfectly willing to do that. Let’s face it in the big scheme of things any B-wave at this stage of the game is just a minor blip. A blip that we won’t even be able to see on the chart by the time the bull is finished. So if I must I will twiddle my thumbs while I wait for the next C-wave. For multiple reasons though, I don’t think this is an A-wave. I think this is still an ongoing C-wave that has one last explosive move higher. On the chance that I’m correct I don’t want to lose my position now. Hey if I’m wrong the bull will correct my timing mistake anyway. This entry was posted in Uncategorized on May 5, 2010 by Gary. I’m going to start off by stating that I don’t think Bernanke is going to “get away” with the insane monetary policy he’s chosen. Printing trillions of dollars, cutting rates to zero, trying to manipulate the bond market and generally tampering with the natural market forces is going to have consequences. There is a price that will have to be paid for this madness. Just like there was a price we had to pay for Greenspan’s reckless attempt to avoid a recession when the tech bubble burst. Greenspan certainly bought some time and a brief period of illusionary prosperity. But he did it by creating a housing and credit bubble. When those burst as all bubbles do, the fallout was much worse than if we had just weathered the recession to begin with. Ultimately all of Greenspan’s and Bernanke’s efforts have just loaded the nation with a monstrous debt burden that we will never be able to repay and soaring unemployment that isn’t going away anytime soon. 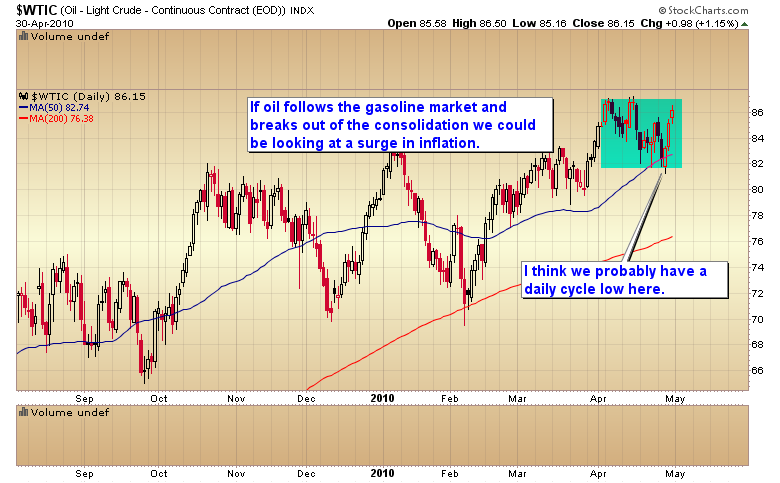 It now looks like we’ve probably seen the cycle low in oil. 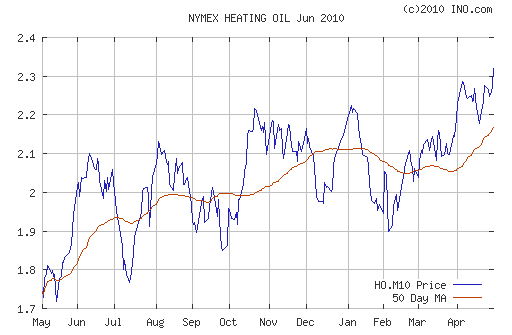 If oil follows the gasoline and heating oil markets to new highs (and I think it will) I’m afraid we are going to get a strong surge higher. And if we did just see the cycle low a few days ago this push could last some time as the average cycle in oil has been running roughly 50 days trough to trough. 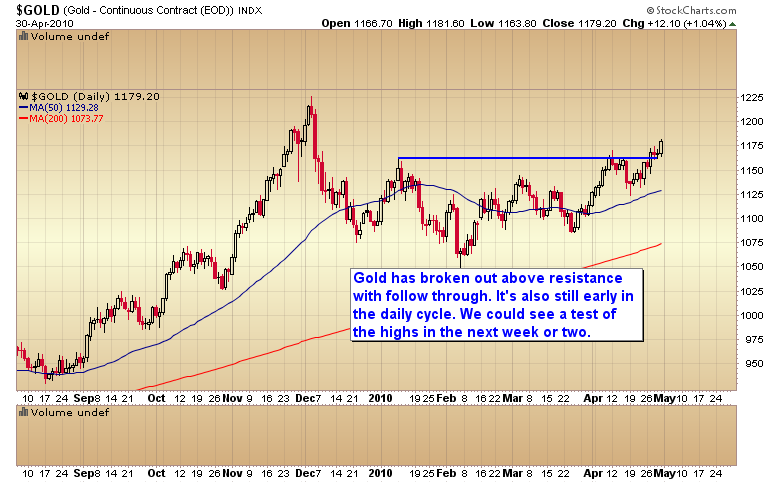 Gold is also early in its daily cycle so we could see a strong push higher here also. I’m expecting gold to at least test the highs during this minor cycle advance. And I’m leaning fairly strongly in the direction of a C-wave continuation for the reasons I outlined in the weekend report for subscribers. Keep in mind that all this is progressing despite a strong dollar. Of course that is just an illusion. It really isn’t possible to print trillions of dollars out of thin air and have a strong currency. The dollar just appears strong because the currencies it’s measured against are exceptionally weak right now. The relentless rise in most commodity prices reveals the truth about the dollars value. I think Bernanke is about to get served notice that he didn’t fix anything. All he did was create a much bigger problem. Unfortunately you and I are the ones that are going to pay for his mistakes with higher taxes and much higher inflation. This entry was posted in Uncategorized on May 2, 2010 by Gary.